This 8 Part brain model by 3B Scientific Germany is a perfect example of a highly detailed model of a human brain. This brain is medially divided wherein both halves of this brain is can be disassembled into different parts and effectively labeled with various brain regions such as frontal with parietal lobes, temporal with occipital lobes, half of the brain stem and a half of cerebellum. If you are looking for an accurate and detailed brain model, this 8-part brain model is highly recommended because it is such a great educational tool for either teaching or learning the human nervous system including the anatomy of the brain. This includes a removable plastic base keeping the parts of the brain intact and steady. Aside from that, the structure of this brain model is aesthetically pleasing because it is made out of solid and high-quality plastic material. Making it a nice display to both office and school when it is not in use. 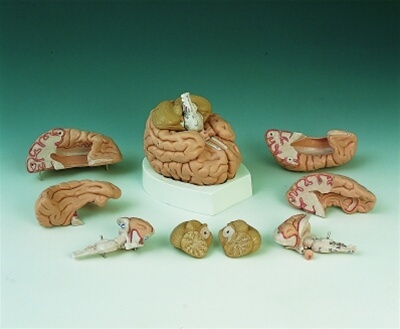 DETAILED-If you are looking for a perfect example of a detailed human brain anatomy, this 8-part brain model is just right for you. This is can be disassembled into different parts including Frontal with parietal lobes, Temporal with occipital lobes, Half of the brain stem and a Half of cerebellum. NICE DISPLAY- The structure of this brain model is aesthetically pleasing because it is made out of solid and high quality plastic materials making it a perfect display for either school or clinic. REMOVABLE PLASTIC BASE- To keep the brain parts intact, it comes with a plastic stand that also serves as its display stand. This model is elegantly detailed and effectively labeled with various brain regions. The construction is aesthetically pleasing and it feels like it is made out of solid material, not cheap.